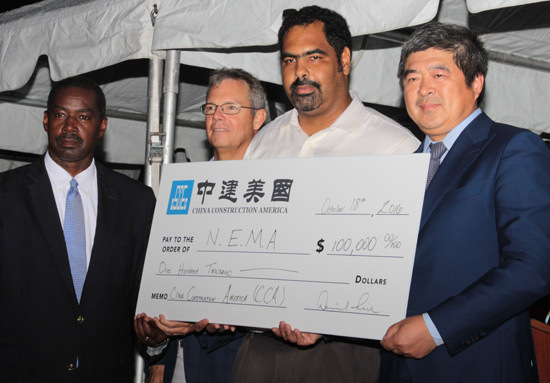 NASSAU, The Bahamas – China Construction America (CCA), the owners of Neworld One Bay Street, the developer of The Pointe donated $100,000 to the Hurricane Matthew Relief efforts. The presentation was made Tuesday, October 18, 2016 at the opening ceremony of Phase One of The Pointe garage and entertainment centre; just next to the British Colonial Hilton. Prime Minister the Rt Hon Perry Christie was on hand for the presentation to NEMA; he also addressed the opening of the facility. Pictured receiving the cheque on behalf of NEMA are Captain Stephen Russell, Director, NEMA; Mike Maura and Gowan Bowe of the National Disaster Relief Committee. The Chairman of China Construction America (CCA), Ning Yuan is pictured right.